American Roots music - old-time, country blues, fiddle tunes, and cajun. 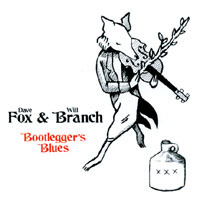 Dave Fox and Will Branch have been playing their own brand of American roots music for the past five years or so, at festivals, clubs, bookstores, libraries, schools, and parties around the midwest. Sing Out! magazine called their first CD, "Bootlegger's Blues," "one very sweet recording" that's "great fun to listen to." From the unhurried beauty of "Cowboy Waltz" to the full-throttle intensity of the title track, this disc is a must have for any fan of traditional American music.